NETWORK UPDATE: Despite all of last night’s football preemptions, only ABC was affected in the final numbers, as THE QUEST lost 0.2 and ROOKIE BLUE lost 0.1 (putting its season finale at the same 1.0 as last year’s). In addition, both BONES reruns on FOX dropped 0.1. Below are last night’s Top 25 cable originals (which actually cover the first 169 shows aired on cable last night) in key demographic categories, along with a few lower-rated series in which we or readers have special interest. If you have any additional titles to add to that list, let us know. Analysis and some context follow the chart. With the night’s NFL PRESEASON FOOTBALL game relegated to NFL Network instead of ESPN (its 0.64 rating in 18-49s was little more than half of last week’s 1.24) and SHARK WEEK done, BLACK JESUS (Adult Swim) took last night’s top slot, despite slipping half a tenth to 0.85. 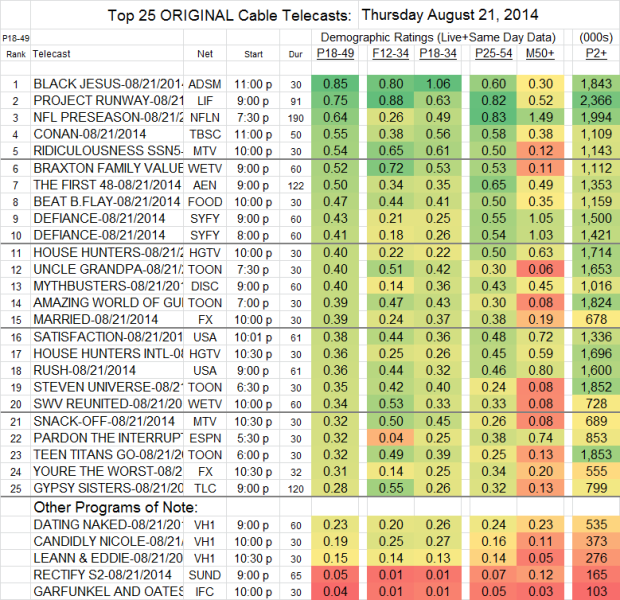 PROJECT RUNWAY (Lifetime) perked up an impressive 0.14 to take 2d place at 0.75. RIDICULOUSNESS (MTV) also had a good night, up 0.13 to 0.54. DEFIANCE (Syfy) has been consistent all season, and its back-to-back episodes were at 0.43/0.41, within half a tenth of last week’s single hour. On USA, SATISFACTION jumped more than a tenth to 0.38, although its lead-in RUSH remained at 0.36. (Not that either of those numbers are good for USA.) The FX pair of MARRIED and YOU’RE THE WORST also had comparatively “good” nights, each up more than a tenth to 0.39/0.31. It was a mixed bag at VH1, where DATING NAKED fell 0.07 to 0.23, while CANDIDLY NICOLE rose 0.04 to 0.19, and LEEANN & EDDIE climbed 0.03 to 0.15. The season finale of RECTIFY (Sundance) seemed to stirr some excitement among its limited audience, more than doubling last week’s total to 0.05. THE HONORABLE WOMAN, not on the chart, dropped to a barely existing 0.01 and 108K viewers nationwide. GARFUNKEL & OATES (IFC) lost more than half last week’s rating to 0.04. NOTE: It’s worth stating that when microscopic ratings like those at Sundance and IFC are being discussed, the size of the Nielsen testing sample is so tiny that a shift in behavior by very few people can cause an enormous effect on the numbers. That probably helps to explain why those shows can seem to double or lose half their audience in a given week.